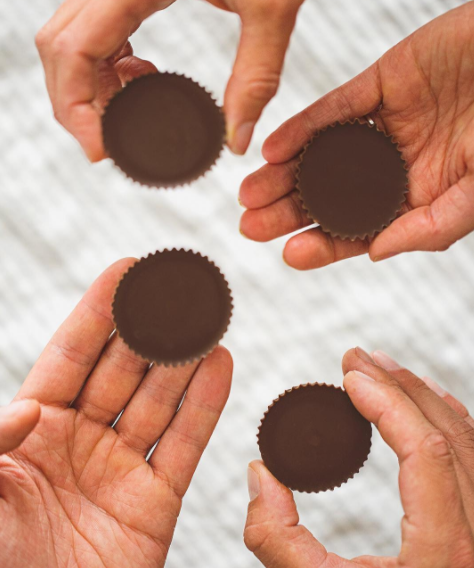 Hear how one food allergy dad's quest for his son to safely enjoy a peanut butter cup changed the course of a chocolate company forever. Today, free2b's full line is free of the Top 12 allergens, vegan, certified gluten-free, non-GMO and Kosher. The sweetest part of the story is not what they leave out, but the high-quality ingredients they include, making their chocolate second to none. Tell us about the moment free2b became an allergy-friendly brand. In 2008 we received a fateful knock on our door. A father with a jar of sunflower seed butter in hand presented us with a challenge: create a candy cup that his son with a peanut allergy could enjoy. Our founder and head of Research and Development, David Lurie, got to work and soon after, the very first Sun Cups chocolate treat was born. To this day we remain committed to creating snacks that are not only Top 12 allergen free but over-the-top tasty. We are passionate about helping people and families with food allergies and sensitivities live brilliantly with as much chocolate as they can eat. What does Top 12 free mean, and why is the company committed to that mission? Top 12 Allergen Free means we never allow peanuts, tree nuts, dairy, gluten, soy, eggs, corn, coconut, sesame, mustard, fish or shellfish in our food or facility EVER. We are so committed to this mission because we believe that everyone should be able to safely enjoy food that is tasty and made from high quality ingredients. We are also certified Vegan, Non-GMO, Gluten free, Kosher Pareve, Fair Trade and Rainforest Alliance. Other than your Sun Cups, what snacks do you currently make? Any new products to look out for? We have three chocolate bars in both rice and dark chocolate, as well as dark chocolate "Snack Breaks," which is chocolate bark that is available in Peppermint, Blueberry Crunch and Cranberry Pumpkin Seed. 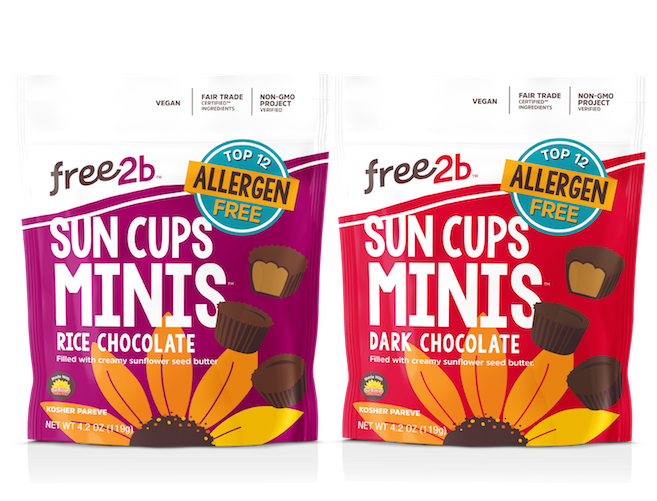 Also, we just launched free2b Sun Cups Minis and are excited to launch our very first non-chocolate snack in early 2018! We’d love your products even if we didn’t have food allergies. What's your secret to making such great chocolate? It really comes down to high quality, whole food ingredients. This means no artificial colors, preservatives, flavors or fillers. We aren't just committed to creating snacks that are Top 12 allergen free, but also to making sure they taste good are better for you. Why did you decide to go dairy free? We made the leap to go dairy free about a year ago, and it felt like the last piece in the puzzle. By making our products milk-free, we could really fulfill our mission to make snacks that most people can safely eat. We source the raw sunflower butter that is used in our Sun Cups from SunButter™️, but we add a few extra ingredients to give it a sweet and distinctly free2b taste. Where are your products made, and why is it important to the process? All of our snacks are made in our very own Top 12 Allergen free facility here in Boulder, Colorado. Only free2b snacks are made in the facility, and we do not co-produce or co-package anything. Allergens are never allowed in our facility, which is enforced with very strict rules and regulations. We source ingredients from a variety of trusted partners, including SunButter™️. When we receive new ingredients, we require documentation that they are allergen free and we also test them ourselves before we let anything into our facility. Making sure each ingredient and finished product is free from the Top 12 allergens is our number one priority. We love chocolate every day of the year but especially on Halloween. What can we give trick-or-treaters? Sun Cups! We are currently offering a Bag O’ Treats for Halloween which includes 40 individually wrapped Sun Cups singles in Dark and Rice Chocolate! No kid should be left out at any holiday or party, so we create bulk bags for most holidays that everyone can enjoy. You can purchase a bag on our website today! Now we are having serious cravings! How do we get our hands on your chocolate? free2b is sold at many natural grocery stores such as Sprouts, Natural Grocers and Whole Foods (until January – but let your local store know that you want us to stay!). We are also sold on Amazon as well as our own webstore. Does the company have an official taster, and how do we apply for the job? Our team is truly a family and whenever our founder and R&D master, David Lurie is creating something new we all sit together and taste test. This is an open forum for feedback and ideas. We also reach out to fans on social media to taste test and recently sent out our newest product to 8 fans who have engaged heavily with us on social media. We work tirelessly to create the best-tasting food. Can you ever have too much chocolate? Any employee favorites? You most certainly can never have too much chocolate! We have been loving the Minis. They're perfect for when you just want a little something sweet and delicious but aren’t ready for a full cup. We know some say it’s technically not chocolate but…will we ever see white chocolate? Maybe one day! But we are very excited to focus our energy into expanding into new snacking categories at this time. What goes better with chocolate, wine or milk? Well, if it’s dairy-free milk we are in! But, wine sounds nice too. win a bag of the NEW minis! !